PM Narendra Modi is undoubtedly a powerful leader, who has provided the country with a new direction with his new vision and powerful decisions. He is today’s one of the most revered leaders. But not just that, he is probably the first Prime Minister that is famous not just for his bold decisions like demonetisation, but also for his most recent fashion statements and expensive trips across the globe. PM Narendra Modi is an avid traveller, a fashionista, a spendthrift and an enthusiastic photographer as well. 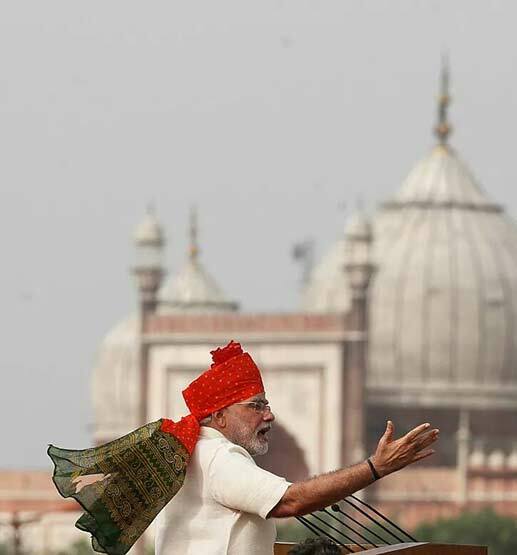 Here are some of the moments when PM Narendra Modi defined the style. The extravagant monogrammed suit worn by Prime Minister Narendra Modi made huge headlines across the country. He had worn this suit at a meet-up with the US President Barack Obama. The navy blue suit had golden stripes, these golden stripes actually read out PM’s name – Narendra Damodardas Modi. 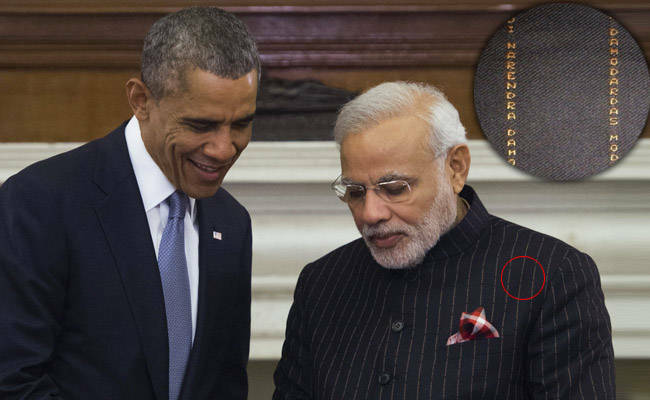 The monogrammed suit worn by Modi was put up for an auction in Feb 2015. It was sold for Rs 4.31 crore. With this, a new Guinness World Book Record was set for the most expensive suit sold ever. The starting price at the auction was Rs 11 lakh. The suit was bought by the Gujarat-based private airline owner and a diamond baron LaljiBhai Patel. 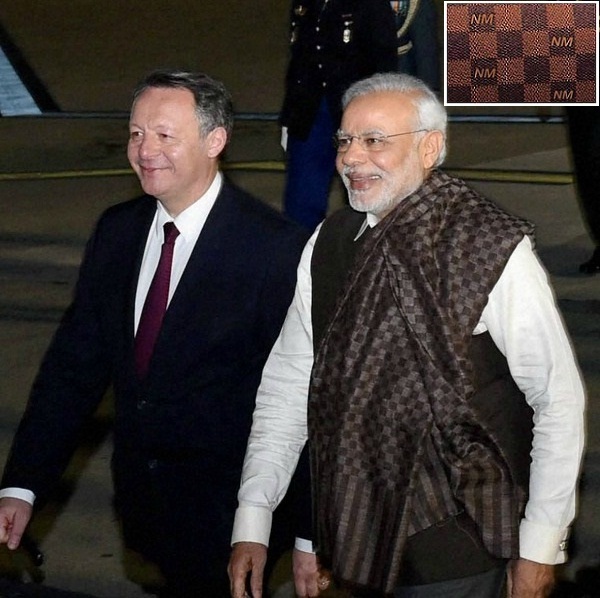 Yet another such fashion moment happened when Narendra Modi was seen donning a dark brown check shawl that actually had the initials of his name printed on it. This shawl was worn by the PM on his visit to France. Narendra Modi is clearly obsessed with his name. 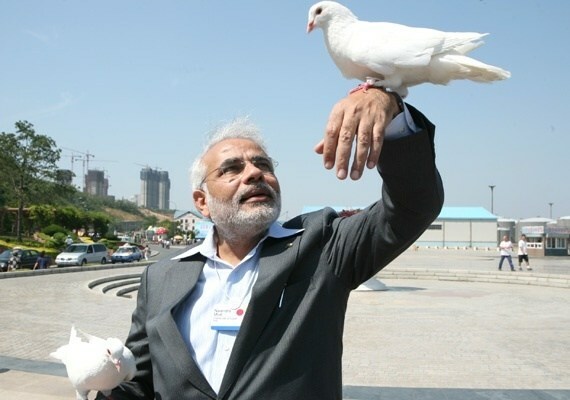 Not just a fashionista, our PM is an awesome poser as well. 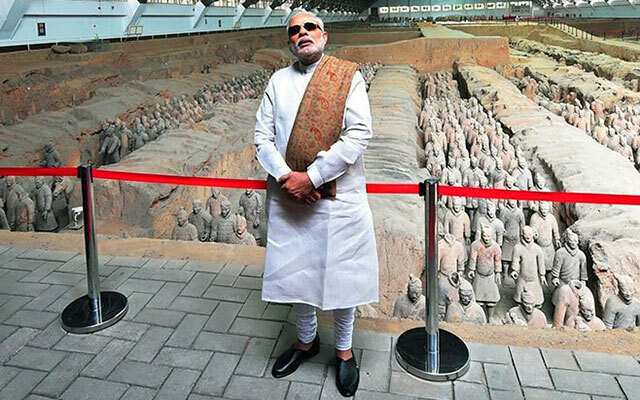 This picture of Narendra Modi posing with the warriors’ statues of Museum of Qin Terracotta is quite depictive of the ‘cool side’ of PM Modi. 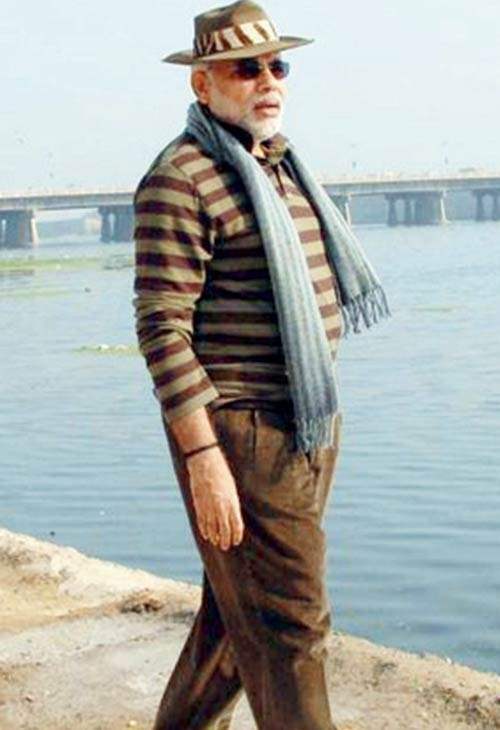 This is one of the most stylish avatars of PM Modi till date. 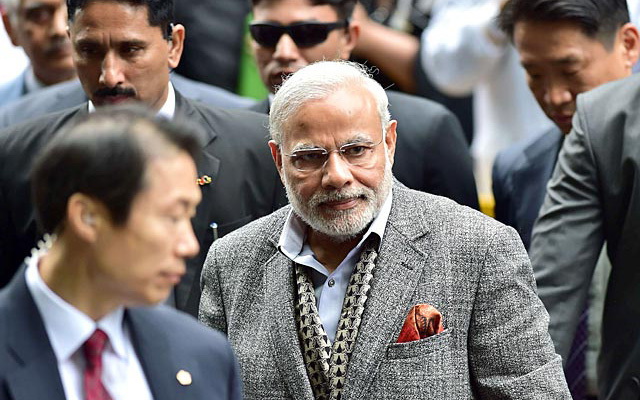 Modi outshined everybody in the crowd when he wore a patterned Gray suit while his visit to South Korea in which he looked totally dapper. 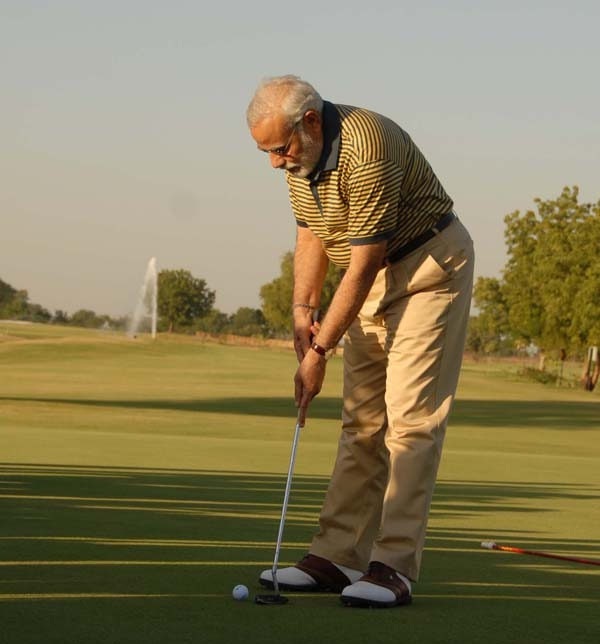 Narendra Modi looked super suave in a striped polo shirt and light brown trousers that he wore while his visit to the golf course. PM Narendra Modi is also fond of big brands like Bvlgari and Movado. In this pic he is seen wearing Bvlgari glasses perfectly complementing his attire with a Movado watch. 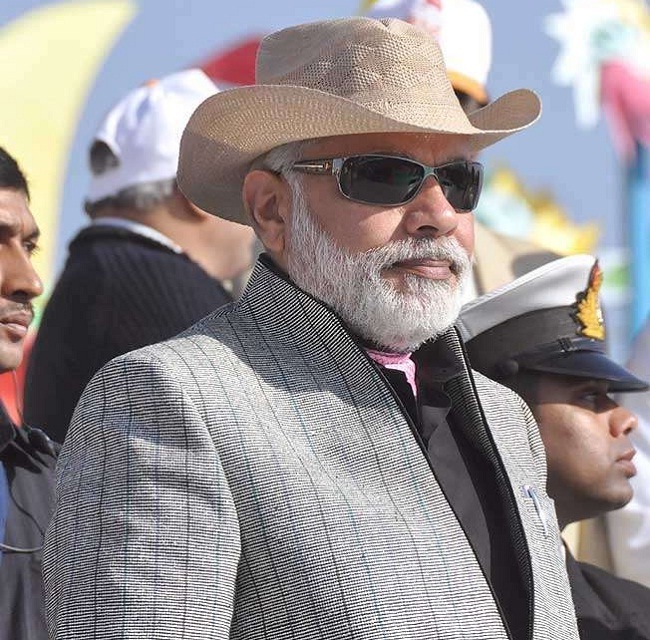 PM Narendra Modi perfectly accessorise to complete his look with an edge-cutting Texan hat. He can sport a hat just like he rocks a multicoloured Pagdi. 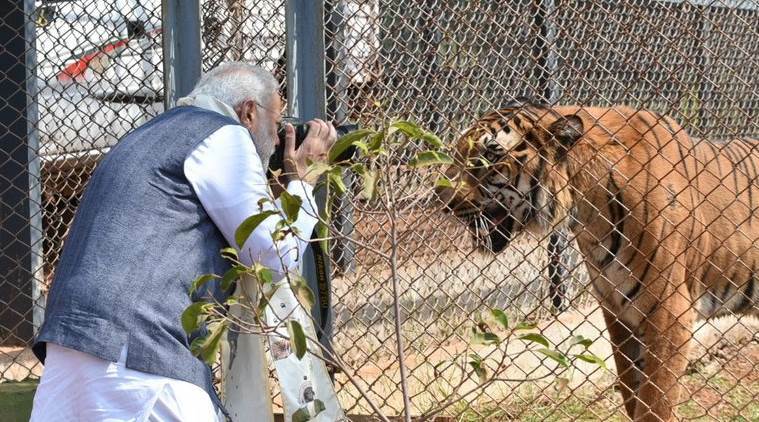 PM Narendra Modi also likes photography as much as he likes his style his look. 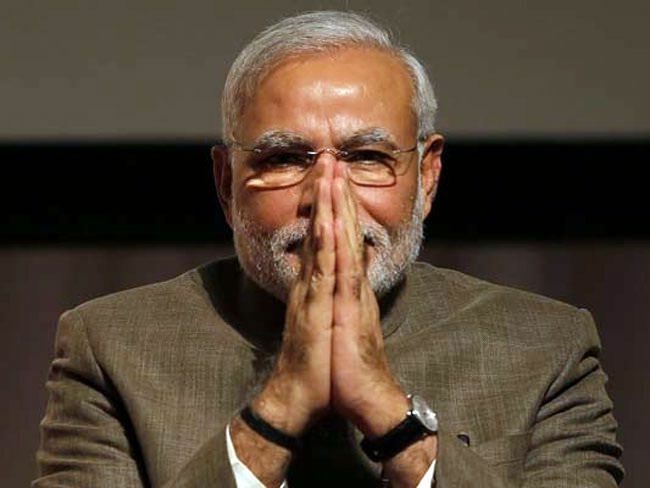 PM Narendra Modi has till date spent hundreds of crores on his clothes, watches and trips for which he has been constantly questioned by the opposition and the AAP party leader Arvind Kejriwal. His extravagant spendings have always hogged the limelight. Last year, at the time of Navratri, PM had spent Rs 10.90 crore on mineral water which raised eyebrows of many political ministers from the opposition. PM Modi was holding fasts in which he only drank water and fruit juices. As per another RTI inquiry, the Modi-led government has spent Rs 1100 crore on advertisements mere ever since PM Narendra Modi assumed the office of Prime Minister of India. This information was provided by the Information and Broadcasting Ministry. This expenditure figure does not include the expenditure done on hoardings, booklets and calendars.